The Parliament’s Digital, Culture, Media and Sport Committee has demanded Facebook chief Mark Zuckerberg “appear before us to give oral evidence” in the fallout over Cambridge Analytica – while an ex-Facebooker is due to spill the beans tomorrow. 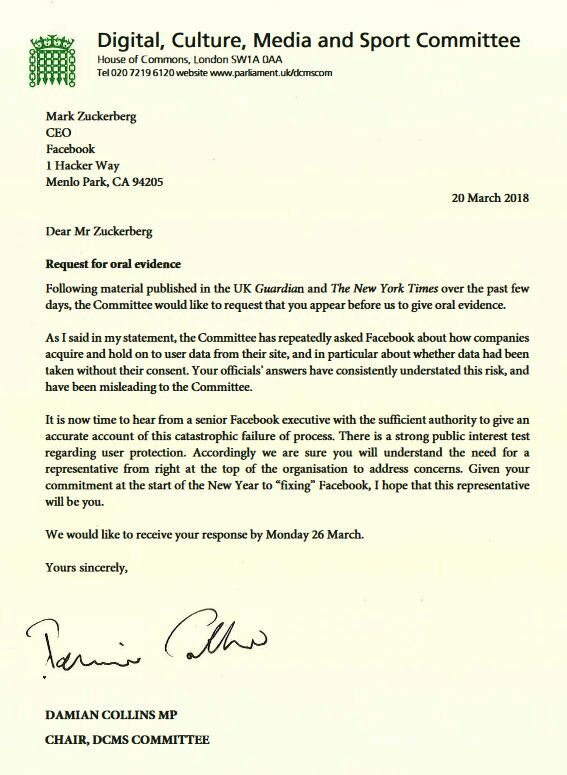 After the DCMS committee chairman Conservative MP Damian Collins announced on Sunday that he would drag Zuckerberg in front of the committee for a grilling, he has since followed through on that threat with a strongly worded letter. “It is now time to hear from a senior Facebook executive with the sufficient authority to give an accurate account of this catastrophic failure of process. There is a strong public interest test regarding user protection. Accordingly we are sure you will understand the need for a representative from right at the top of the organisation to address concerns,” said Collins’ letter, which we reproduce below. There’s just one small snag. Zuck is an American citizen, meaning he can safely ignore any such summons. If a British or Commonwealth citizen, or someone living in the UK, did that, they would risk being jailed for committing contempt of Parliament. As it is, while Zuck would undoubtedly piss off the MPs by giving them a stiff ignoring – and it's not a savvy business move – legally he is safe. Naturally, the hope of the MPs is that Zuck makes an appearance. Cambridge Analytica is the public affairs firm which collated data from sources including social media and used it to micro-target voters in political ad campaigns. CA executives were featured on Britain’s Channel 4 News last night boasting to an undercover reporter posing as a client that they had swayed elections, sent prostitutes to rivals’ addresses, and all the other unsavoury things you’d expect from a consultancy outfit keen to part political punters from their money. CA worked with the Donald Trump US presidential election campaign and was acknowledged by unofficial Brexit campaign group Leave.EU as a partner, in spite of later denials from CA. Facebook has told the world it has “suspended” doing business with CA. Collins has also announced that “former Facebook operations manager Sandy Parakilas will be giving evidence to the committee”.